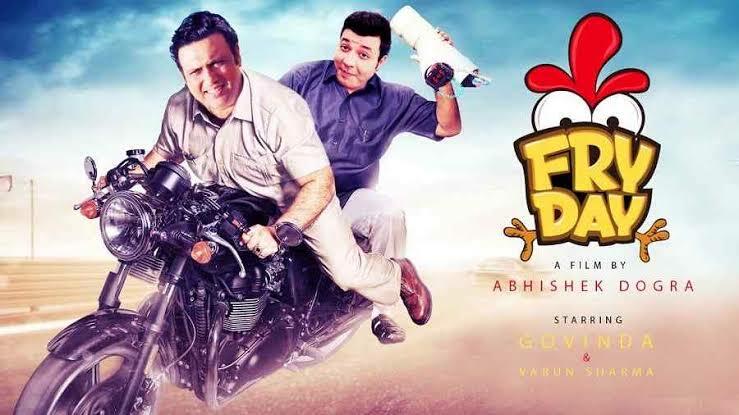 Fry Day, Govinda’s comeback film of sorts, has been released just when #MeToo movement is in full swing. It glorifies adultery to the hilt and shows the protagonist as a serial flirt unrepentant of his actions even after being almost caught red handed by his wife in the film. He’s shown to have gone unpunished as well and all these things don’t gel with them times we are in. Having said that, isn’t it true that most of the accused named in the campaign are unrepentant of their actions — so maybe the film isn’t that off the mark either. It should be noted that Fry Day has consenting adults indulging in promiscuous behaviour and nowhere it’s shown that the hero is forcing himself on anybody. Failed water purifier salesman Rajeev (Varun Sharma) is given ultimatum by his boss to sell at least one unit by Friday or he loses his job. Luckily for him, he does land one sale but unknown to him, the woman who confirmed the booking isn’t the one found in the house. She happens to be theatre actor Gagan’s (Govinda) girlfriend Bindu (Digangana Suryavanshi), who has come to spend time with him as his wife is away. A comedy of errors ensues, wherein a thief (Brijendra Kala), an electrician (Ishtiyak Khan), Gagan’s wife (Prabhleen Sandhu), and Bindu’s police inspector husband (Rajesh Sharma) join in the fun. How, through a series of lies and just plain luck, Gagan extricates himself out of the sticky situations forms the crux of this slapstick comedy. Govinda seems to be having fun in the film taking potshots at himself. His introductory scene, where he’s recreating the famous confrontation sequence between Akbar and Salim on stage, has him stealing the dialogue of his fellow actors and incorporating them in his lines. That’s something Govinda was often accused of in his heyday. Then, he also jokes about the fact that Digangana is so much younger to him and actually shouldn’t be his girlfriend. His gift of mimicry still remains intact and the way he goes around spouting dialogues in the style of yesteryear actors is hilarious. He’s as fluid in his facial expressions as he was during his prime and extracts a laugh by silently conveying things through his actions. He’s on a roll and the others try to match his intensity. The only one who comes close is Varun Sharma. The duo do rub off each other and we wish there were more scenes involving them. The film reads more like a play than cinema, what with characters making their entries and exits on regular basis. However, there is no conflict as such, what with Govinda finding explanation for almost everything and the wife gladly swallowing the hogwash. Debutant Digangana Suryavanshi, who has done TV earlier and who was also seen in Jalebi, releasing the same day, makes a confident start on the big screen. The rest of the cast is sort of underutilised but are competent enough actors to do their job well. Slapstick and broad comedy needs a taut screenplay but what director Abhishek Dogra has done here is to rely much on the spontaneity of his actors. While that works as a TV skit, a little more finesse is expected in a film. Better writing would certainly have generated more laughs. Watch the film to experience a dash of vintage Govinda. He still retains most of his tricks and let’s hope gets better films in future to showcase them.